Several years ago, in my Borderland of Adventure campaign, our band of heroes explored a fragment of the upper level of The Forge of Fury. Sadly, their exploration was cut short when their foray alerted a tribe of orcs in the upper level. In the ensuing battle, the party were forced to flee—and only escaped because of the heroic sacrifice of one of their number. Not running the rest of the module is one of my biggest—recent—gaming regrets. However, at the time the campaign was much more a sandbox affair and the party chose to go elsewhere, instead of returning to the Forge’s blood-soaked halls. Such is life. Anyway, my thoughts have again returned to The Forge of Fury as part of my quest to analyse good—and bad—dungeon design. I’ve always been impressed with the adventure; for my money it’s one of WoTC’s best 3rd Edition era modules. This feat is made even more impressive because it’s one of the first 3rd edition modules and thus the designer—Richard Baker—was still grappling with new rules. Sure, the module doesn’t really have a particularly clever or convoluted plot—in essence it’s a fairly standard dungeon crawl—but complexity isn’t always the be and end all. Often, simplicity is superior to complexity. As a basic, flavoursome dungeon crawl I think The Forge of Fury is particularly well executed. Why? Read on! The Mountain Door: The entry level primarily comprises dwarven defences. The Glitterhame: A large series of natural caverns. The Sinkhole: Dark, dank caverns, forgotten dwarven storerooms and a subterranean river. The Foundry: Dwarven halls and chambers comprising a forge and other areas. The Black Lake: A large, winding cavern filled with water seeping down from the nearby Dark Mere. And—as an aside—the levels are laid out so that the party can explore as the mood takes them. While they have to go through certain areas to progress to the Black Lake (the final level) they can explore the upper levels pretty much as they want. I love this feature of the dungeon’s design. Current modules are much more linear—and poorer for it. The Mountain Door: An orc tribe led by Great Ulfe (their ogre chieftain) has claimed the Mountain Door. The Glitterhame: Troglodytes dwell in the Glitterhame. A few other scavengers and suchlike share the caverns. The Foundry: Undead and perfectly working dwarven traps lurk in the foundry along with a handful of duergar who have begun to explore the forges. The Black Lake: The main—indeed only—foe here except the frigid waters of the Black Lake is a young black dragon. The combat is made harder by the fact she is very much at home in the lake’s waters while the party could find themselves at a serious disadvantage. Empty Space: Unlike modern adventures, not every chamber or cavern in Khundrukar hosts a denizen or trap. Some places are empty or abandoned; nevertheless many are well described so the players can poke about and the GM can build the dungeon’s (and level’s) flavour into his game. That’s a refreshing change to dungeons these days. (As an aside, I’m running a dungeon at the moment and virtually every room in the relatively linear dungeon has a monster or trap in it—which I’m finding less than exciting to run). Hard (and Easy) Encounters: Some of the foes lurking in Khundrukar are easy to overcome; others—notably the roper and a succubus—are spectacularly hard to defeat and could wipe out the party. Very hard and very easy encounters are a feature of Old School play which has fallen out of favour in recent editions, but which I wish was more prevalent in Pathfinder. I’ve blogged before about our obsession with balance and I think the CR system—while well intentioned—is to blame for a lot of the angst around “unbalanced encounters”. Multiple Entrances:There are several ways to get into the dungeon, although two are hardly obvious. That’s good, though, because skilled players may find one or more of the hidden entrances, which—after all—rewards superior play. As a dungeon crawl, I think Forge of Fury does a lot of things right. However, it’s not perfect. Role-Playing: Most of the encounters in The Forge of Fury can be solved with good old fashioned violence. While there’s lots of scope for exploration, clever tactics and sandbox exploration, not many of the encounters are resolvable through role-playing. That’s a shame as it doesn’t leave a tremendous amount of things for bards and the like to do. Similarly, players who prefer role-playing will find few opportunities to practise the fine arts of diplomacy, flattery and betrayal. Remote Location: The Forge of Fury can be set virtually anywhere in a GM’s campaign, but it “works particularly well if you pick a remote range of hugged hills or highland several days from the nearest town.” While that’s not necessarily a problem, it does mean the PCs are a decent distance from a safe base in which they can restock, rearm and rest. This might slow exploration of the dungeon down as the PCs trek backwards and forwards. This isn’t a deal breaker by any means for me, but it’s something to consider when planning to run the adventure. No Wandering Monsters: The adventure has no wandering monster tables. I love wandering monsters—even though they have fallen out of favour in recent editions. No Rumours: I would have liked to see a “Whispers & Rumours” style table in the Introduction or Character Hooks sections. Most players are going to try and find out more about the place before they visit it—if only to be better prepared—and it would have been nice to have a handy table of such facts available for the GM. I love rumours, and I have fond memories of that great table in B2 The Keep on the Borderlands—and the players trying to work out which rumours were true and which were false! At the end of the day, though, these are all pretty minor gripes, which any competent GM could easily fix. The Forge of Fury is a great low-level adventure I’d highly recommend to anyone who hasn’t played it yet and who likes dungeon crawls. Did I miss anything you particularly like or dislike about The Forge of Fury? Let me know, in the comments below. Want More Dungeon Design Tips? Check out all my musings on dungeon design here by scrolling down to the handily titled “Dungeon Design” section or check out my own nascent megadungeon–Gloamhold! See I own Forge of Fury, but have never run it. Having just started a new Pathfinder low level sandbox game, I might have to drop it into the map as an adventure site. I’m currently using the Duchy of Ashlar map as I think it’s a great sandbox to get some lapsed players back into playing. I’m growing to love Old School design more and more as I do like my players to have a world that seems as real as possible, and not just that the world levels as they do. Keep up the great articles Creighton, you are acting as my Old School guide! Thanks for the jolly kind comments, Gareth. You made my morning! If you are using Ashlar for your campaign setting, I’d recommend sticking the Forge of Fury where Vongyth currently stands. Along with ‘Tomb of Abysthor,’ my favorite 3rd Edition module. It’s hard. Really hard. And I’ve softened up the entry portion before, but I think that Forge is a great deal of fun. It’s also a nice module to use if you want to run a “dwarves reclaiming a lost hall” adventure. Somehow I missed the Duchy of Ashlar. Now I have another beginning sandbox area! WooHoo! I originally purchased Forge of Fury after reading Creighton’s players’ woes in that dungeon. I figured any adventure that had orcs with a sneaky way to hit the party from the other side was an adventure I needed to hunt down! I’ve been on an old-school kick recently, rereading Caverns of Thracia and looking at hex-crawls. No good can come of this! I ran Forge of Fury after starting in Raging Swans’ Swallowfeld. Notice a trend there? I love your modules, Creighton, and I hope you write a couple more next year! You really capture that old school feeling that my party loves so much. I ran Forge of Fury for the first time ever this year and my party and I had a blast. It had enough of a sandbox element to it that they didn’t feel railroaded but it was challenging enough that they had to pick and choose when and where to fight. On a concept level it is a lot like Shadowed Keep. Blimey. Very cool. Thank you for the kind words. Hopefully, you’ll enjoy Gloamhold when I release the Campaign Guide–which is my main focus over the next month or so. I’m also putting together a Collector’s Edition of Fane of the Undying Sleeper, which will be out early in 2016 with new maps, illustrations and an updated text. I think you’ll like it if you liked Agains the Cult of the Bat God. That sounds very cool. I’d love to see the lament. I’m terrible with poetry and that kind of thing. Can I steal it for my campaign–to lure my player back there sometime? That sounds absolutely tremendous! That’s what game mastering and making pre-written adventures your very own. I do like this module, and for many of the reasons you listed! I like the maps too- not overly complex, but nicely done! 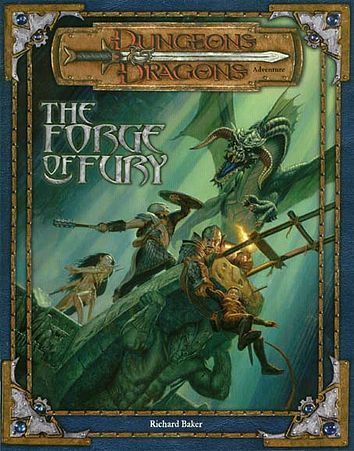 Forge of Fury is one of my top 3 adventures, of all time, for the same reasons you listed. As for the “cons” listed, an experienced DM can easily make adjustments to suit thier needs. As a DM, I have taken on the challenge of roleplaying my monsters wherever possible. Any creature that has a language, whether it is understood or not, has the potential to attempt to negotiate with the characters. You just have to give it a motivation that is stinger than eating the heroes. It is a fine adventure, and I have adapted it for my campaign, leaving clues to further adventures within the Forge. The minor short comings that you note can be remedied without too much work by any game master worth his/her salt. I enjoyed the adventure very much, though I agree with you – there aren’t many opportunities for role-playing as the module is written. Perhaps it’s just my group. I don’t know why, but Forge of Fury, on paper, looked amazing. When we played back then, though, it turned into a pretty boring slog. The dungeon’s architecture and change of scenery is great and all, but the constant emphasis on ” (Attempt to) KILL EVERYTHING”, the lack of interesting, skill-based options and roleplaying opportunities made it a chore to finish. Sure, a good GM can add them…but better modules have that hard-baked into them. Compared to many other dungeons of this size, I was missing the details, the small weirdnesses. In a strange way, it turned into an old-school looking dungeon that ticks off all boxes, but still doesn’t come together as it should. To me, it was painfully run-of-the-mill and never really managed to captivate any of my players. It actually became a reason I playtest as many adventures as possible. More often than not, playtesting can show weaknesses. Personally, I consider all your adventures to be vastly superior, and same goes for FGG, Kobold Press and a ton of OSR-adventures out there. That’s jolly decent of you, old chum. I won’t turn down your kind words! My group enjoyed Forge of Fury when we played through it, and I have fond memories of running it. However, it was one of the first 3rd edition adventures we played, so we were happy just to be back playing D&D again. There is a really cool adventure called Mines, Claws and Princesses (pay what you want on Drivethru) that was inspired by Forge of Fury and is well worth a look. I have no connection to the author! Thanks for the recommendation, Jeff. I’ll check it out! It sounds intriguing.